A Interim Group Management Report 5 Executive Summary 12 Property-Casualty Insurance Operations 22 Life/Health Insurance Operations 28 Asset Management 32 Corporate and Other 35 Outlook 37 Balance Sheet Review 44 Reconciliations Interim Report Third Quarter and First Nine Months of 2014 Allianz Group 11 Events after the balance sheet date For information on events after the balance sheet date, please refer tonote 41tothecondensedconsolidatedinterimfinancialstatements. Other information Business operations and group structure The ­Allianz Group’s business operations and structure are described in the Business Operations and Markets chapter in our Annual Report 2013. 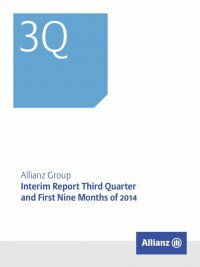 Effective 1 January 2014, the ­Allianz Group allocated certain enti- ties from the reportable segment Asset Management to the report- able segments German Speaking Countries, Western & Southern Europe and Growth Markets within the business segment Life/Health and to the reportable segment Banking. We also tackled difficult issues, such as the restructuring of Fire- man’s Fund. AGCS will be taking over the commercial Property & Casu- alty business of our subsidiary in the United States. The new struc- ture will allow us to better explore growth opportunities and utilize the potential of our strong Allianz brand. As far as the business with retail customers is concerned, we are currently looking into various options. The Supervisory Board of Allianz SE has agreed to the request of Michael Diekmann to not further extend his board appointment beyond the Annual General Meeting (AGM) on 6 May 2015. He will remain Chairman of the Board of Management up to that day. Oliver Bäte has been appointed as new CEO of Allianz SE with effect from 7 May 2015. His contract has been extended until 30 September 2019. Oliver Bäte will continue to be responsible for Global Property and Casualty up to the AGM 2015. The Supervisory Board has also agreed to the request of Clement Booth to not further extend his board appointment. His mandate will end by 31 December 2014. Upon mutual agreement and in keeping with his request, the board man- date of Gary Bhojwani will end by 31 December of this year. The Supervisory Board appointed Dott. Sergio Balbinot as a member of the Board of Management of ­Allianz SE for a duration of four years starting 1 January 2015. Sergio Balbinot will take over responsibility for the insurance business in the countries of western and southern Europe (France, Benelux, Italy, Greece, Turkey). Also effective begin- ning of next year Dr. Axel Theis has been appointed as a member of the Board of Management of ­Allianz SE with a duration of four years. He will be in charge of the global industrial insurance business, credit insurance, reinsurance and the insurance business in Ireland and Great Britain. Starting 7 May 2015 he will also take over responsibility for Global Property and Casualty from Oliver Bäte. Manuel Bauer’s appointment has been extended for another year until the end of 2015. The appointments of Dr. Dieter Wemmer and Dr. Werner Zede- lius have been extended by three years and the appointment of Dr. Helga Jung by five years. Starting 2015 Manuel Bauer will also take over responsibility for the insurance business in Australia and as of the same date Jay Ralph will take over responsibility for the life insur- ance business in the United States in addition to his current respon- sibilities. Strategy The ­Allianz Group’s strategy is described in the Strategy and Steering chapter in our Annual Report 2013. There have been no material changes to our Group strategy. Products, services and sales channels For an overview of the products and services offered by the ­Allianz Group, as well as sales channels, please refer to the Business Opera- tions and Markets chapter in our Annual Report 2013. Information on our brand can also be found in the Progress in Sustainable Develop- ment chapter in our Annual Report 2013. Basis of presentation The condensed consolidated interim financial statements are pre- sented in millions of Euros (€ MN), unless otherwise stated. Due to rounding, numbers presented may not add up precisely to the totals provided and percentages may not precisely reflect the absolute figures. Previously published figures have been adjusted accordingly.